Da Vinci Code author Dan Brown has done what many “alternative history” researchers wish they’d done: written a blockbuster mystery which presents to an enormous audience theories that fly in the face of mainstream history—and made a great deal of money doing it, dammit! I enjoyed the book immensely, and don’t begrudge Brown his success. However, since a crucial section of the book deals with the freemasonic and Knights Templar heritage of Scotland’s Rosslyn Chapel, a subject I’ve written extensively about, I’d like to point out a major flaw in his data. Brown’s positioning of Rosslyn on the same longitude as Glastonbury Abbey at a pivotal point in his narrative is one of the grander hooks upon which his story hangs—but it is wrong. Rosslyn’s north-south meridian does not run “precisely” through Glastonbury. In fact, it runs a whopping 17 miles to the west. So precisely where is that “central pillar” of Britain’s sacred geometry? In my “Pyramids of Scotland” article (Atlantis Rising #35) I talk about a strange geometry of leylines I’d discovered in Scotland’s landscape. One of those lines, I report, “stretched exactly due south from Craigleith Island to the Cistercian Abbey of Melrose. Founded contemporaneously by Abbot Bernard of Clairvaux, the Cistercians and the Templars are thought by many to be two arms of a single order.” I also write that “if the line is continued far to the south of Melrose it arrives, unerringly, at Glastonbury.” That article, with an enlargeable graphic of the geometry mentioned, is archived on this website. But while the Rosslyn meridian misses Glastonbury’s by 17 miles, the chapel nevertheless lies on one of the other lines I mention in my article—and it’s a highly interesting line. Let’s go back to August 5, 1999. While visiting a friend in the village of Temple, the ancient Templar headquarters lying just five miles southeast of Rosslyn, I was shown an inscription beneath the belfry of the town’s ruined kirk (Scots for church). My translation of that inscription, which in part suggests that Jesus had sired children by Mary Magdalene, ran in the May 2001 issue of Fortean Times magazine, and is also archived on this website with some new and interesting endnotes. I had visited Rosslyn earlier that day, and had photographed a tiny statue in the chapel’s crypt—a statue of a bearded figure, thought to be Saint Peter, holding a book and a key. When I examined the photo some weeks later, I noticed that there was a pyramidal shape carved into Peter’s beard that cut across the natural flow of the hair in a way that no sculptor worth his salt would have done, except by design. Immediately below the pyramid’s capstone was Peter’s mouth. When I noticed that his mouth was disproportionately small, I suddenly began to make a series of decidedly spooky observations. Hidden within St. Peter’s face was a smaller face that shared his mouth, but was proportioned correctly to it. The eyes peered out from Peter’s nostrils, with what appeared to be a hand, raised alongside as though either saying “Hello,” or waiting to whisper. I noticed that the chin of that hidden face formed the head of an even-smaller being, and was connected to a complete body. There he stood—left foot resting on Peter’s book and his arms making a grand thespian gesture along the shaft of Peter’s key. Situated on the crypt’s south wall, Peter’s key pointed in the direction one would take to go from Rosslyn, through Temple, to Melrose Abbey. 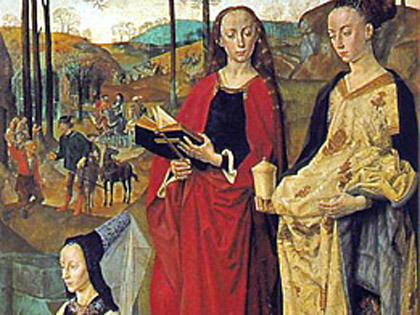 There also seems to have been no love lost between Mary Magdalene and Peter. In the Pistis Sophia, one of the Gnostic Gospels, Mary says “I am afraid of him because he hates the female race.” And in the Gospel of Thomas Peter says “Let Mary leave us, for women are not worthy of life.” By using St. Peter to reveal a heresy that could undermine the credibility of the Vatican by emphasizing the long-suppressed importance of Mary Magdalene, Peter’s sculptor would have been exacting a fair measure of revenge on Mary’s behalf. But that’s perhaps not all the statue was meant to reveal. Of the charges brought against the Templars at their trial, many mention the order’s secret reverence for severed heads. The first of those reads “in each province they had idols, namely heads, of which some had three faces.” Hmmm! In my “Secrets of Rosslyn Chapel” article, however, I show there are elements of the chapel not part of its original architectural fabric. 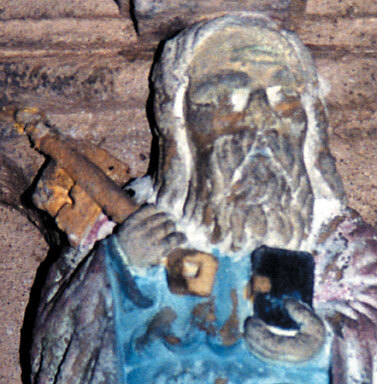 In fact, it seems they have been added relatively recently—and St. Peter is one of those elements. Architect Andrew Kerr, referenced in that article, makes no mention of the statue in his exhaustive 1876 survey published in the Proceedings of the Society of Antiquaries in Scotland. So why is it there now? I suppose that Kerr should not have believed the evidence of his own eyes, nor I his account. I’ve visited Rosslyn several times since 1999, however, and must admit that I cannot see in three dimensions what I see in my photographs of Peter. Why so? The answer may lie in the great interest shown in Rosslyn by photographic pioneer Louis Daguerre, inventor of the daguerreotype. In 1822 Daguerre invented the Diorama, a technique whereby two-dimensional paintings could be illuminated in a dark room to give the illusion of three-dimensional reality. He created a Diorama of Rosslyn Chapel, which received rave reviews. Could Daguerre have guided the hand of Peter’s sculptor in the opposite direction, hiding a secret in three dimensions that could only be seen in two, to create a tiny statue that would be introduced into the Rosslyn Crypt when the time was right? And is it possible that Daguerre may have even been chosen to inherit the knowledge that would later write his name large in the annals of photographic history? One might consider that the Shroud of Turin, recently debunked as a medieval forgery, is nevertheless a photographically “negative” image. 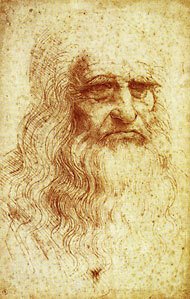 In their 1994 book about the shroud, Picknett & Prince go so far as to suggest the relic was photographically created by none other than Leonardo Da Vinci. But on to Temple’s ruined kirk. 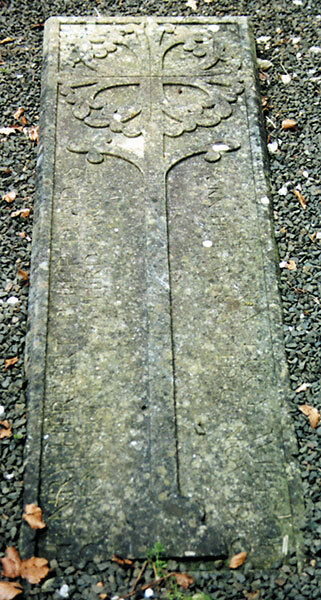 The Temple graveslab clearly shows a chalice, but no blade. Why not? Let’s read the inscription. “Beatrix Lucy, wife of Henry Herbert Philip Dundas of Arniston, third baronet, born 14th May, 1876, died 6th Nov. 1940.” It is actually the grave of a woman who died within living memory and, if we allow Gardner’s line of reasoning, carried forward the bloodline of Jesus and Mary Magdalene! Researcher Tim Wallace-Murphy claims that it’s always the female bloodline that’s important, not the male. “Mummy’s baby, Daddy’s maybe,” I suppose. Temple was granted to the Templars by King David I, presumed by Gardner to be a Grail Family member. Upon the order’s dissolution it transferred to the Knights Hospitaller, and remained there until the Protestant Reformation, at which time it reverted again to the crown. During the reign of Scotland’s first officially freemasonic king, James VI, the property transferred to the Dundas family until recently passing into the stewardship of the Midlothian Council, where it still remains. Beatrix was born Lady Beatrix Douglas-Home. The Douglases and Homes are two families whose names have long buzzed with possible Templar and freemasonic connections. Sir James Douglas was Robert the Bruce’s trusted lieutenant mentioned in my Bannockburn article. And Joan of Arc’s battle banner is thought to have been painted by a Home. It’s also rumored that a replica of Joan’s ring, inscribed “Jesus Maria,” was given to Home’s daughter. In Glastonbury Abbey is a similarly inscribed stone, and we might well wonder which Mary was meant to be immortalized in either case—the Virgin or the Magdalene. 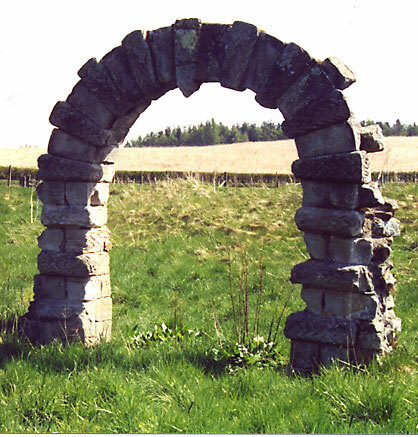 Southeast of the Temple ruin stands an ancient archway, derelict in a field. It appears to lead to nowhere, yet is so oriented that if you walk straight through, as I did, you are heading on the same bearing as the line that connects Rosslyn and Temple to Melrose. Alternating stones in the arch are covered in a herringbone pattern that repeats the letter “M,” again and again, as though driving home a long-forgotten point! Now to Melrose, 21 miles away as the crow flies. 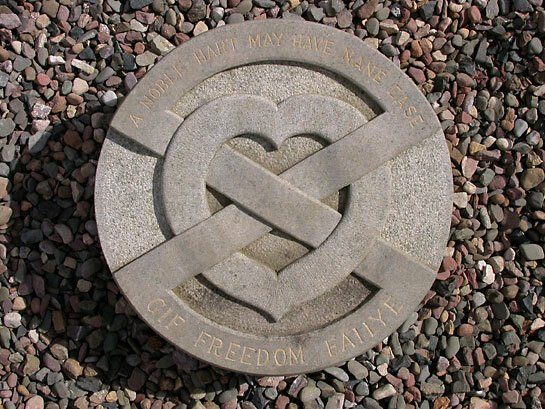 Scots hero Robert the Bruce’s heart is buried in Melrose Abbey. History tells us that a dying Robert asked that his heart be buried in the Holy Land. Carrying Bruce’s heart in a silver casket, James Douglas duly set off in the company of seven knights, one of whom was William Sinclair of Rosslyn. After dallying a tad too long in Spain, they were pulled into a military engagement with the Moors. 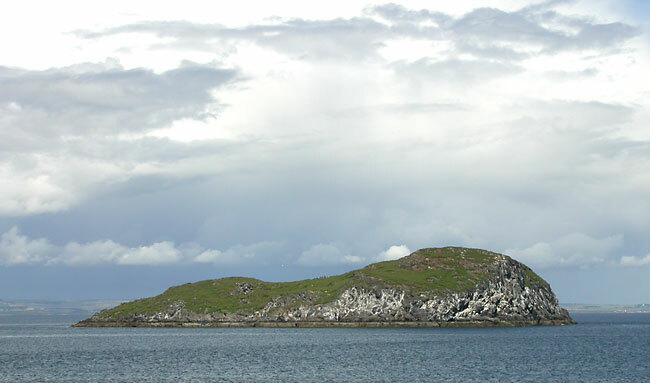 Four died, including Douglas and Sinclair, and Bruce’s heart was returned to Scotland by the remainder of the company. If we retrace our leyline just 44 miles to the northwest of Melrose, back through Temple and Rosslyn, we come within spitting distance of Dunfermline Abbey, where Robert’s body is buried. History does not tell why the two, having again come so close, were never reunited. Much is made in The Da Vinci Code that the original spelling of “Rosslyn” was “Roslin,” tying a neat bow around the book’s “Rose Line” theme, and connecting Rosslyn with Glastonbury along the same meridian. But it is Melrose Abbey and Craigleith Island that lie exactly due north of Glastonbury, not Rosslyn—and “Melrose” also contains “rose” as a root. One accepted etymology of “Melrose” puts the mason’s hammer, or “mel,” before the “rose-colored” sandstone used to build the abbey. While the abbey sometimes exhibits a pinkish hue in certain light, the root “mel” could derive from elsewhere. The Greek roots melas and mels mean “of a darkish color, or black” and “a limb,” respectively. Might I suggest that “Melrose” may mean a darkened branch of the rose or holy bloodline, brought to Scotland for safekeeping by the Templars and then branded into the landscape over a long-forgotten geometry that far preceded the birth of Christ? And while etymology is on the table, let’s now consider cryptology. One of the several ancient spellings of Craigleith is Craglieth—an anagram of Grail Tech! Beatrix Douglas-Home was daughter to the 12th Earl of Home and aunt to the 14th, Alec Douglas-Home. Alec was secretary to Prime Minister Neville Chamberlain when Chamberlain’s appeasement policy calmed world alarm over Nazi excesses until the onset of World War II became inevitable. Alec was later appointed Foreign Secretary, and dubbed a Knight of the Thistle in 1962. At the height of the cold war, thanks to 1963’s Profumo Call-Girl Scandal, Alec became British P.M., and later Chairman of the still extant Bilderbergers, an elite association of international power brokers now thought by many to have engineered the state of the world we live in today—such as it is. If, as the carving on Beatrix’s 20th-century graveslab may imply, the “holy blood” still flows—and more importantly is still known to flow by some—to what agenda has this knowledge been put over the centuries that we lesser mortals are not privy to? How many saints and heroes have been cobbled together to keep the common herd content with their lot, ever-eager “to do their bit” for God and Country? And how many sovereign heads have been toppled to bring us to this dark and uncertain world we find ourselves in today? But conventional thought dictates that Jesus did not have children, and that anyone who thinks otherwise is a fool. Nevertheless, I again claim that certain world myths have been hijacked over the millennia, and secretly woven into the warp and weft of the source documents historians use to write our textbooks. I’ve found in my own area of research, for example, that John Barbour’s The Bruce and Walter Bower’s Scotichronicon, both roundly criticized by academia as nationalistically biased, have nevertheless been vehicles through which the underlying truths of those myths have been slipped between the lines—truths which have gained ever-more purchase in recent years. It’s been my hope these truths would not be driven underground again by silence or disdain, the two reliable weapons that have so often helped shape the “approved” version of history we are taught in school. But while hope ever “springs eternal in the human breast,” that hope is fading fast. I fear that particular human trait has been long recognized as a weakness, and has been used as a familiar tool, over the millennia, by those privileged few who pull our strings and yank our chains—those who safely push the model ships and tanks around on the great flat maps in war rooms all over the world. In that knowledge of our weakness has always been their strength. Last year’s controversy was Dan Brown’s Da Vinci Code. This year’s is Mel Gibson’s Passion of the Christ. While Gibson’s Passion points the finger of blame for a divine Christ’s crucifixion, Brown’s Code challenges Christ’s divinity by suggesting he had a mortal daughter who survived it. Christians and Jews are once again at odds over matters that mainstream history refuses to adequately examine, and that “faith” continues to inadequately explain. But to whom was Twain talking?